From 1977 to 2013 Gibson have used an 8 digit serial number on all of their guitars. This can be easily decoded to show the exact day that the guitar was manufactured along with the location of the factory. From 2014 onwards this was changed to a simplified 9 digit number which can still be used to find the year of manufacture. For earlier guitars or if this tool fails you can use the pot decoder to get a date of manufacture for the pots. Enter your Gibson guitar's 8 or 9 digit serial number in the box below to find the year and month of manufacture along with where it was made, This decoder currently supports Gibson guitars from 1977 to date (older guitars coming soon). 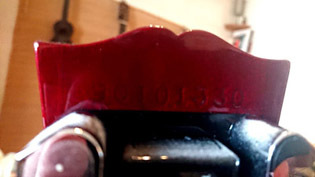 The serial number can be found on the back of the guitar's headstock.